I was at the post office today and noticed the U.S. flag was flown at half staff. President Barack Obama has ordered that flags be lowered at government buildings on November 22, 2013 to commemorate the 50th anniversary of President John F. Kennedy's assassination. However, personally I feel it's more important to remember what JFK attempted to achieve and than how he was assassinated. So, I went to watch his inauguration speech on YouTube. After more than 50 years and many progresses have been made, many of his statements and challenges still ring true. One of many that stood out was "if a free society cannot help the many who are poor, it cannot save the few who are rich." Then, "...... we shall pay any price, bear any burden, meet any hardship, support any friend, oppose any foe, in order to assure the survival and the success of liberty. This much we pledge -- and more." 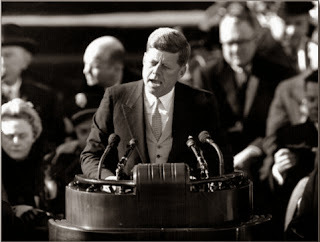 As a token of resolution, I went online and bought a copy of the postcard showing JFK was delivering his inauguration speech on January 20, 1961. You can purchase your own copy here.